HALIFAX—Scott Gow put his name in the Canada Winter Games history books as the first athlete ever to win four gold medals while leading Alberta to the top of the podium in the men’s 3×7.5-kilometre relay on Friday in Halifax. The 20-year-old Gow, who stomped the field in each of the first three individual competitions, needed his best performance to secure his place in history. Gow took a marginal lead out on the Ski Martock course after his Calgary-based teammates, Stuart Harden and Aaron Gillmor, fought off a Quebec team determined to prevent an Alberta sweep of the medals this week. Gow was first to enter the range, but missed two shots in prone position, while Quebec ace – Vincent Blais – shot clean. With Gow heading to ski two penalty loops, Blais took over the lead until he made a costly error entering the wrong shooting lane in his second trip to the range. Gow capitalized, shot clean in standing, and darted out on his final trip around the 2.5-kilometre track to complete the Alberta sweep of all 10 medals in men’s competition with a time of 59 minutes, 33.0 seconds. Quebec held on for the silver medal after clocking-in at 1:00:01.4, while British Columbia won the race for the bronze after posting a time of 1:04:48.7. While Gow and Alberta swept the medal podium all week in men’s racing, Quebec athletes captured their fourth gold medal of the week. The relay trio of Audrey Vaillancourt, Yolaine Oddou and Rose-Marie Cote teamed up to handily win the women’s 3×6-kilometre relay with a time of 1:01:22.00. Alberta’s women’s athletes reached the podium for the first time this week, finishing second at 1:04:53.1. British Columbia won the race for the bronze, crossing the finish line at 1:05:34.8. 1. Alberta, 59:33.0; 2. Ontario, 1:00:01.4; 3. British Columbia, 1:04:48.7; 4. Ontario, 1:08:20.4; 5. P.E.I., 1:09:29.3. 1. Quebec, 1:01:20.0; 2. Alberta, 1:04:53.1; 3. British Columbia, 1:05:34.8; 4. Ontario, 1:09:20.21; 5. Manitoba, 1:13:11.8. Alberta’s Scott Gow made a clear statement he is the top young biathlete in the country after winning his third straight gold medal at the Canada Winter Games in Halifax on Wednesday. Holding a marginal lead on the field in the men’s 12.5-kilometre pursuit competition at the start where athletes began the race in five-second intervals, the 20-year-old Gow never looked back. With the next generation of Canadian biathletes following his trail through the Ski Martock course, Gow stomped the field again to post a time of 32 minutes 41.8 seconds. The member of Canada’s development squad arrived to the Canada Winter Games from the Czech Republic where he led the red and white with a ninth-place finish at the Junior World Championships. Calgary’s Gow and his Alberta men’s teammates have been the story of the Games at the biathlon venue having swept the podium in each of the three individual competitions. His kid-brother, Christian, fought his way onto the podium for the second time this week after winning his first silver medal with a time of 34:12.2. Calgary’s Stuart Harden, who had a silver and bronze medal heading into Wednesday’s action, captured another bronze after the 16-year-old punched the clock at 34:43.8. Western Canadian athletes may have celebrated in the men’s race, but it was Quebec who took charge in the women’s 10-kilometre pursuit, snagging all three spots on the women’s podium. Audrey Vaillancourt won her second gold, and third medal of the week, after crossing the line in top spot at 34:39.5. Finishing well back of Vaillancourt, Quebec’s Yolaine Oddou won the silver medal with at time of 34:51.6. Rose-Marie Cote finished nearly 90 seconds off the leading pace to round out the women’s podium in third at 35:51.8. The biathlon events wrap up on Friday at Ski Martock with the men’s and women’s relay competitions. 1. Audrey Vaillancourt, Quebec, 34:49.5; 2. Yolaine Oddou, Quebec, 34:51.6; 3. Rose-Marie Cote, Quebec, 35:51.8; 4. Julia Ransom, British Columbia, 36:27.5; 5. Sarah Beaudry, British Columbia, 37:33.2. HALIFAX—Alberta’s Scott Gow captured his second-consecutive gold medal at the Canada Winter Games while Sarah Beaudry, of British Columbia, sprinted to her first Games’ victory in the men’s and women’s action on Tuesday in Halifax. The 20-year-old Gow stomped the field for the second-straight day to win the men’s 10-kilometre sprint. Battling wind gusts up to 60-kilometres/hour and blowing snow swirling over the Ski Martock layout, the Calgarian missed just two shots to post a time of 29 minutes, 2.4 seconds. “The conditions were absolutely brutal today. You just had to wait the wind out on the range,” said Gow, whose Alberta teammates swept the podium for the second time in as many races at the Canada Games. Aaron Gillmore fired into the silver medal position at 29:45.2, while Stuart Harden shot clean to follow up his opening-race silver on Sunday to post a bronze-medal winning time of 29:55.2. Meanwhile Sarah Beaudry, of British Columbia, stormed onto the top of the podium in the women’s 7.5-kilometre sprint. Beaudry clocked a winning time of 22:36.9. 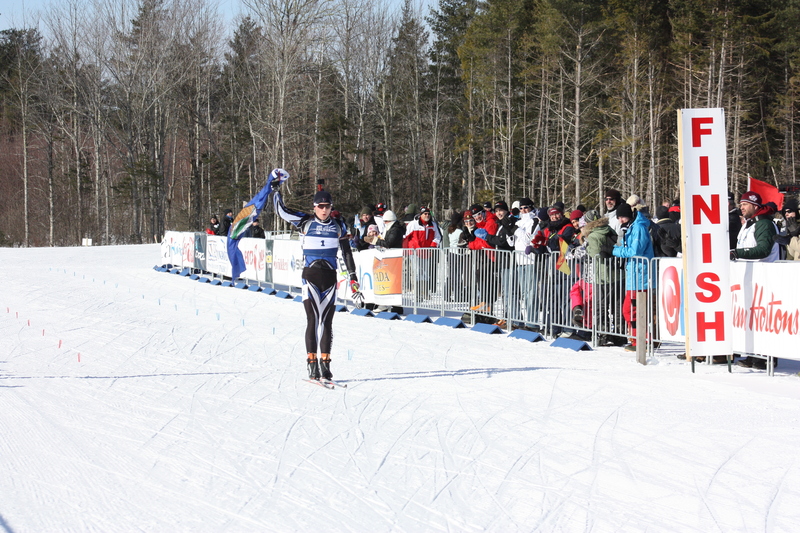 Beaudry held off a hard-charging Audrey Vaillancourt, of Quebec, who charged to hersecond podium finish of the Games by winning the silver at 23:27.8. Vaillancourt was sandwiched between two British Columbia athletes on the podium. Julian Ransom locked up the bronze after clocking-in at 23:53.3. The biathlon events continue on Wednesday at Ski Martock with the pursuit competitions.